What is Microcurrent and how does the Natural Non-Surgical Facelift work without surgery? Microcurrent Technology is the only Aesthetic facelift treatment available that can physically firm and tone the skin through muscle re-education without the need for any surgical intervention. By reproducing the body’s own biological current we can re-establish muscle memory naturally thus bringing more definition to the face and body without surgery. The Microcurrent Non-Surgical Facelift is proven to be safe and effective as the Microcurrent mirrors the body’s own natural current and works in harmony with the body’s electrical system. It is commonly described as “facial toning or non-surgical facial lifting” due to the dramatic lifting effect that the microcurrent has on facial muscles and facial contours. At MySkin UK, we use the latest and most advanced aesthetic microcurrent equipment, technology applications and training knowledge to customise the non-surgical facelift treatment to support your individual needs. Originally developed for treating facial palsy, microcurrent therapy is now also used widely in Physiotherapy for pain control and in hospitals for wound healing. In the 1960’s Drs S. Baker and S.Doyle demonstrated that effective and long term muscle re-education could only be achieved using microcurrent if ultra-low frequencies (less than 1 Hertz) were used. Combining ultra-low frequencies with a modified waveform enables the microcurrent to recharge the electrical potential of the muscle by stimulating the spindle cell fibers that run the length of the muscle and attach to the Golgi tendon organ in the belly of the muscle. This Golgi tendon organ (GTO) simulation technique was developed by Dr George Goodheart in the late 60’s. True microcurrent uses a current with an intensity of less than one millionth of an amp (< 1mA) and because of its low intensity it does not cause a physical or visual contraction of the muscle, instead, microcurrent stimulation works by a process called muscle re-education. Working a muscle from belly outward will have a lengthening/relaxing effect that is necessary on muscles that have become contracted over years of facial expression (e.g. frown lines). Working a muscle from the origin and insertion point inward will have a shortening effect that is necessary for the majority of the muscles that have become elongated over time due to age and gravity. Although a remarkable difference is seen after the first treatment, the benefits of microcurrent are cumulative and typically a course of 12 treatments will be required for the most optimum results. Microcurrent impulses trigger a chemical reaction at a micro cellular level to increase the effectiveness of how our bodies use ATP (adenosine triphosphate; a complex organic chemical responsible for creating energy in all living cells). 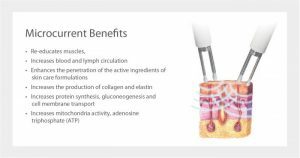 A precursor to DNA and RNA, ADP is an essential process in helping to rebuild and sustain the building blocks of your skin. (4) The synthesis of other high-energy compounds. Book now for your first Non-Surgical Microcurrent experience, conducted by qualified and knowledgeable staff.